Do you have an 'angry personality'? People suffering with alcoholism or drug addiction may have a history of anger. There are many reasons why some people suffer more than others due to mood disorders, personality disorders, depression and a myriad of other mental health issues. Anger, like stress and other powerful emotions, has a profound effect on the body and manifesting in physical complications. Aching Limbs – the build-up of glucose in the limbs can make our arms and legs feel heavy and tired. In addition, we tend to tense our muscles in preparation for flight or fight and this tension causes pain. Many people turn to drugs and alcohol for temporary relief of aches and pains. Headache – Blood supply increases to the brain to enable us to think more clearly, but build-up cause’s headaches. Again, some people may turn to alcohol or prescription drugs to calm them down after an anger outburst and subdue their headache. Neck ache – Again, we tend to tense our neck muscles when stressed, causing pain. How often have you felt your shoulders sink down when the stress has subsided? Tiredness – We feel tired because we have been burning up so much extra energy during angry outbursts or experiencing a tirade of abuse from a member of the family. Dry mouth – Flow of saliva is reduced to the mouth during stressful times. Stomach ache/butterflies – Blood is diverted away from this area so digestive mechanisms are reduced – this can lead to digestive problems and discomfort. Dizziness – Although we breathe more quickly when we are feeling angry or emotional, we tend to take more shallow breaths and thus we do not breathe in as much oxygen as we do normally. This can lead to a slightly reduced supply to the brain, causing dizziness. 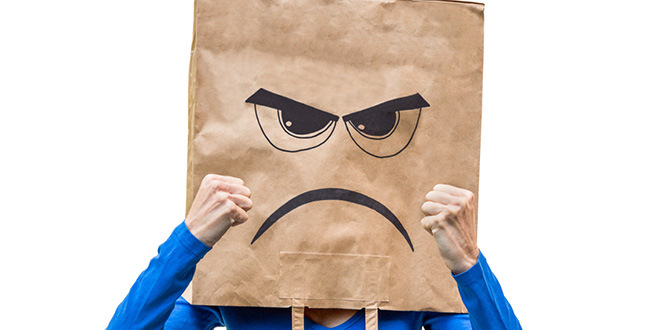 Feeling and suppressing anger has specifically been linked to a variety of health complaints including job stress, heart disease, high blood pressure and anxiety. Even expressing anger is thought to be highly stressful, despite commonly held views that it is cathartic to release anger, inducing rapid heartbeat, blood pressure irregularities and more stress. If you are suffering with alcoholism or are addicted to drugs or prescription drugs, you may be masking the underlying cause of your anger. Have you been checked for Bipolar 1 or 2? Have you grown up in a dysfunctional environment leading to a possible cause for your anger and suppressed by alcohol or drugs? You may have complex post-traumatic stress disorder or a myriad of personality or mood disorders. Alcohol is only a symptom of an underlying problem. The use of drugs or prescription drugs can mask the real cause of your anger. Get help from your doctor and be honest with him about your anger problems. They may be able to help you with mood stabilising medication or guide you to the right support group to help you manage your anger. Domestic Violence is rampant in our society and compounded by the use of alcohol and drugs, masking the real reason for anger outbursts. Seek help for your problem before your problem puts you behind bars. I would suggest helping yourself cope with the rigors of living with a practicing alcoholic by looking at supplementing your diet with an amino acid and a natural relaxant to help you sleep at night. Adrenal Natural Glandular - If you support the function of your adrenal glands, you have more chance coping with the everyday pressures of life. Many people suffer with morning fatigue and depression due to sluggish function of the adrenal glands. The adrenal glands are 2 small glands that are situated just above the kidneys and when they are working efficiently, they produce extra surges of energising hormones such as cortisol, adrenalin and DHEA to help you face the challenges of the new day. In other words, the adrenal gland hormones increase your resistance to stress and provide the drive and energy to succeed.